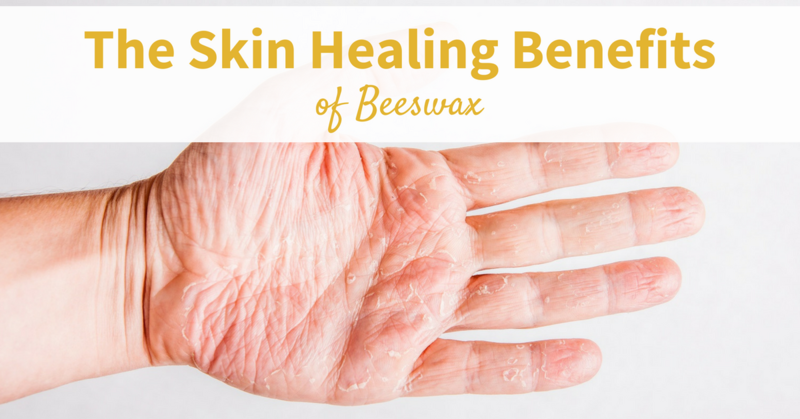 Whether you suffer from dry skin, eczema, psoriasis or have a burn to heal, beeswax just might bee the answer according to the latest studies. It's not uncommon to see beeswax as an ingredient in skin care products, and the reason why is this: beeswax does not just protect beehives from microbial invaders. It can also act as a potent protector and healer for your skin. Researchers have discovered a number of benefits to this substance, which is why we feel that it belongs in your medicine cabinet and your toiletry bag. There are a number of reasons that beeswax is so powerful. Beeswax is made from a fluid secreted by young bees when they are between the ages of 12 and 18 days. This is the period of a worker bee's life when she sticks mostly to the hive and performs a nursing role to young nymphs. The fluid, when it comes in contact with the air, solidifies into the form that we are most familiar with. While a number of insects secrete wax, humans typically use only that created by two species of honey bees, Apis cerana and Apis mellifera. These two species have been reared by humans for millennia and have developed a powerful symbiotic relationship with us. Beeswax is harvested from hives and then used for a number of purposes, both in skincare and other areas. Beeswax is a highly complex substance with hundreds of components. It includes fatty acids, hydrocarbons, fatty alcohols and esters. The composition of wax will vary depending on factors that include the time of year, the geographic location of the hive and the bees' diet. The earliest mentions of beeswax as skin therapy go back to the ancient Egyptians. Beeswax was used in remedies for burns, wounds and joint pain. Beeswax continued to be used in ancient Rome, where physicians would use it in a cream they called "cold cream." This cream contained beeswax along with other soothing ingredients like olive oil and rosewater. It was used to treat cuts, bruises and burns. Today, Ayurvedic medicine continues to use the power of beeswax in a number of treatments. It can be used alone, or mixed with ingredients like jaggery sugar. In a study performed in Dubai, the power of beeswax was tested against two organisms: Staphylococcus aureus, which causes skin infections and candida, the most common type of yeast involved in yeast infections. The test was performed in a lab where a mixture containing beeswax was applied to plates that had been cultured with each of those microbes. The study showed that beeswax was effective against both microbes. In other studies, it has been shown to fight other bacteria, as well. For instance, a study that involved beeswax in methanol and ethanol extracts (basically, types of alcohol extracts) showed that the solution was effective against a wide range of bacteria, including some types of e coli. At a time when more and more organisms are becoming resistant to antibiotics, this is an especially important discovery. Reducing our dependence on antibiotics and using natural remedies instead could potentially reduce the speed of the development of antibiotic resistance. Beeswax is rich in vitamin A, which makes it especially soothing and moisturizing for your skin. If you are suffering from painful dry skin, windburn or sunburn, this moisturizing action can help you stay more comfortable and help your skin get back to its smooth and supple state. Many people are prone to heel cracking, especially as they age. This condition can become extremely painful and can, left untreated, lead to infection. Beeswax applications have been shown to be especially helpful in healing this sort of injury. Beeswax, because it is extremely hydrophobic, can also help keep your skin from getting dry or chapped in the first place. Used in a lotion with an oil like grapeseed oil or jojoba, beeswax will help prevent skin from drying out, which can prevent damage. It can help speed healing. In a study on burns, it was found that a solution that included beeswax and olive oil helped burned skin heal much more quickly. Additionally, skin treated with the beeswax solution was far less likely to scar or to develop infections. In a time when more and more people are realizing that microbes are becoming resistant to allopathic medicine, the embracing of natural products like beeswax is more important than ever. If you are prone to skin infections, burns or other injuries, beeswax products can be a vital and healing part of your natural medicine chest.